Intimacy is the confluence of trust, vulnerability, strength and beauty. While each of these elements are subjectively interpreted by individual couples, recognition of the geologically blessed wonder that is the setting of Larsmont Cottages is universal. Inspired by vintage Scandinavian fishing villages, Larsmont Cottages is neatly tucked amidst 40 private acres. Dramatic evergreens and mature hardwoods. Thirteen hundred feet of pristine Lake Superior shoreline. The perfect setting for your intimate wedding and reception. The perfect setting for launching new lives, dreams, promises. Don’t miss out on these opportunities to save! These special offers cannot be combined with one another or any other offer. Save 10% on all wedding rental packages for the remaining 2019 dates. Available for remaining dates between November 2019 and April 2020. Save 50% off wedding rental packages for Monday-Wednesday ceremonies! Larsmont Cottages’ private dining room beautifully accommodates up to 50, and includes access to our outdoor patio all evening, complete with complimentary bon fires, s’mores and yard games for boding new families and cementing old relationships. Our wedding concierge will be with you every step of the way helping plan, organize and cater to your needs. Ledge Rock Grille’s award winning cuisine is prepared by our expertly trained Executive Chef and we specialize in customizing menus perfect for any occasion. Even joy, hopefulness and elation can induce stress. Celebrate the culmination of months of planning and mental preparation by rejuvenating your senses in our authentic Finnish, wood-burning sauna; perhaps a relaxing Couple’s Massage in our Massage Cottage just feet from the water’s edge. After your vows have been taken, rings exchanged, marriage license signed and wedding party exhausted, spend your wedding night sipping champagne and laughing over recently made memories as you continue to make new ones under the stars in our four-season outdoor whirlpool. Amazing experience! Aprill is fantastic and made sure our entire weekend was perfect. The servers and bartenders were great and we wanted for nothing during our stay! The location is absolutely beautiful and all of our guests loved having a whole weekend getaway there. My husband and I stayed for a few extra days and took advantage of the amenities to relax after the busy wedding weekend. Highly recommend it! We started planning our wedding with Aprill and she was absolutely fantastic. She took note of every detail and made sure everything was perfect for our wedding day. The property is breathtaking and it was a dream hosting our wedding there. We couldn’t have picked a more perfect location for the best day of our lives. Thank you all so much for helping to make our wedding as beautiful as it was. Our whole weekend couldn’t have been any more perfect. You all did such a wonderful job making it all happen! Our experience at Larsmont was wonderful. We were very pleased with the onsite coordinator, Aprill. She was very responsive to our needs and helped with any questions. in regards to the weekend itself, the staff was very accommodating to guests, the experience was what we imagined and was described to us, and the food was wonderful. 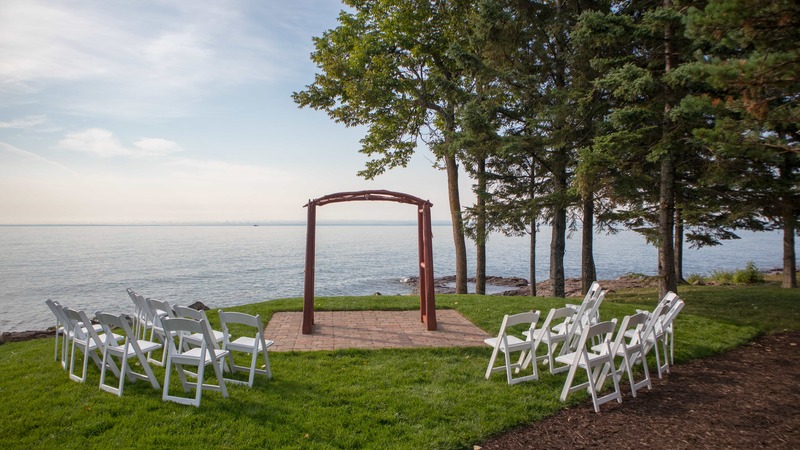 We enjoyed having a ceremony with 46 of our closest family on friends right on the shores of Lake Superior, a small reception with background music and a first dance out on the patio of the reception room, and a night of celebrating with yards games and a bonfire outside. We would recommend Larsmont to anyone looking for an intimate wedding experience.